Welcome to Zero Emission driving. My husband started the new year with a brand new electric car. Follow along as we try to survive “range anxiety.” Learn from our tips for finding charging stations, getting cash for going electric and plugging in at home. And, share your stories about going electric. Here’s the story of how it all began which I wrote about in the San Jose Mercury News. My husband and I had an important appointment and dinner planned for last Monday evening. Then, why did he arrive so late? And, why afterwards, did we get stuck eating our dessert in a deserted parking garage at 10:30 that night? Welcome to life with an electric car, week one. Already, it has the makings of a reality show. I could tell that the idea to buy a battery-charged vehicle was ruminating in my husband’s head for months. Every now and then, he would mention it, and then, the topic arose more and more often, especially after we watched “Chasing Ice” a movie about the disappearing polar ice. I would listen, nod, and ask a question now and then. How much would our electricity bill go up? How many miles can you get out of a charge? Where do we find charging stations? Undeterred, he backed up his argument with research, including a slew of financial rebates and incentives offered by the state of California to pioneers – or Guinea pigs, depending on your perspective- willing to enter the yet unrefined realm of driving gasoline-free. When we moved to California in 2006, we shed one of our cars before leaving the East Coast and proudly navigated life with a single automobile for four years. We took public transportation, and rode bicycles only to be defeated by the inconveniences and lack of independence. In 2010, we signed a three-year lease for a second car. My husband got stuck with the old car, a stubbornly efficient Toyota . With 253,000 miles, the car could likely run for a 100K more, but it needs oil at almost every gasoline stop, and feels a little less sturdy these days. Perhaps a Zero Emission car could give us reliable transportation, and assuage our guilt of having a one car per person ratio in our family? I was not convinced, but I was intrigued as my husband test drove the Nissan Leaf and the Chevy Volt. I drive 80 miles round trip to and from work, and it would be an unusual day if the Leaf could take me both ways on a single charge. And, there is no charging station in my employer’s parking lot. As for the Volt? Once the battery charge lowers to a certain level, its internal combustion engine fuels an electric generator, extending its range. Nice! Still, it is more expensive than the Leaf, and the incentives being offered by the state and the dealership are not as sweet for the Volt as with the Leaf. So, there we were on New Year’s Eve at the Sunnyvale Nissan showroom signing the papers to commit to three years of battery-fueled driving. After the signing, the salesman shot a photograph of the happy couple posing in front of the car. He also told a funny story of a doctor who bought a Leaf, and in the first week had to cancel all his appointments unexpectedly because… well, you guessed it. I was thinking of that story as I ate my pomegranate frozen yogurt that Monday night, standing in the electric vehicle section of the Palo Alto parking garage waiting for the Leaf to charge. My husband had driven the Leaf from our San Mateo coastside home to the San Bruno BART station to take BART into San Francisco. There are no charging stations at this BART stop –although I could have sworn that during our negotiations my husband had argued that “ hey, I can charge it at Bart.” On a typical day, none of this matters because a single charge can take him roundtrip to work and back home. On this day, however, he was making a detour to Palo Alto. The dashboard of the Leaf showed that there were 19 miles remaining in the charge. Home was 22 miles away. He left work early to give himself enough time to park the car at a charging station, and then, walk to meet me for our appointment. Palo Alto, according to his smart phone app from ChargePoint http://www.chargepoint.com/chargepointnet/mobile-apps.php has one of the highest concentrations of charging stations. But apparently the city also has one of the highest number of electric cars and hybrids. He arrived at a parking garage and then, another to find that he had been elbowed out by a collection of Teslas and Volts . California’s goal is to construct enough charging stations to accommodate 1 million zero emission vehicles by 2020, but apparently it has a long way to go. He gave up and jogged to meet me. Afterward, I drove him to the garage where he had left the Leaf, and still, the vehicles were consuming the coveted voltage. Couldn’t we just unplug them and steal 5 or 10 miles? With these chargers, it would take less than an hour to add enough charge to get us home. We restrained ourselves, and moved on to the next garage. Alas, there was a vacant charger. My husband pulled the line from the charger and plugged it into the front snout of the car, and settled in to wait. I kissed him goodbye and headed home. Then, I took mercy on him, stopped Fraiche yogurt, returned with the treat and waited it out with him. Our marriage had survived our first charging crisis. Then, that Sunday as we were heading out to explore the coastline, my husband said “Hey, let’s take the electric car.” Now, that’s another story for another day. We were one of the first Leaf customers in 2011. We had replaced our 2005 Prius. We are not as ecologically minded as you are – we actually have 4 cars, 2 gas, the Prius plug in, and the Leaf. We got the Leaf and Prius in order to use the car pool lanes. I was a fan of electric but after having the car for about 18 months – I realize that there is no way they will ever build out the charging station networks. (My rationale is that some of the charging networks are charging a dollar/hour, I am paying a dollar/day for a 7 hour charge). I work at Intel, and they have only installed 2 chargers (the company who installed them went bankrupt) – and we have over 40 electric car owners vying for the 2 chargers. I suspect once the car pool sticker program expires in 2015, whatever demand there is for Volts and Leafs will dry up (no pun intended), since many are bought for that purpose. The Leaf is really designed for the “average” commute of 5-10 miles/day (which is virtually impossible to do in California). I will say that the Leaf is very inexpensive; we installed a dedicated electric meter for the car – and our electric bill is running about a dollar/day (to charge both the Leaf and Prius plug in) – so the Leaf is basically paying for itself in gas savings vs. our gas powered car. But – I think electrics will be a short lived fad, with hybrids ultimately winning out. And, electrics are not selling at all outside of California in any volume (no car pool advantage). Thanks for sharing your perspective. It does seem that in a place such as Silicon Valley there is a Catch 22. There is a large concentration of drivers with “green” vehicles, yet because of that, the charging stations are overcrowded. I’d like to think that these cars are not just a passing fad, and that eventually, the technology will keep up with our demanding driving-heavy lifestyles. Meanwhile, it looks like we are going to have to work with what we have. I don’t think we’d be able to survive with only electric cars in our fleet at this point unless we could afford a Tesla, and unless we win the lotttery, that is not happening. I am curious about the company which went out of business, can you provide the name. Are there no incentives for Intel to build more charging stations with another company? In Atlanta Leafs sell at a rate of about 1000 per dealer per month. My dealer has an ocean of Leafs and one month they pumped out 2000. Now if only someone would build the promised charging stations. I use my house charger overnight which is good for me. I can only hope people get smart, it is a perfect car for all around town, with the Nissan dealers letting us charge there gets a safety factor. I always make it home. Maybe one day people will understand the price fixing in the oil industry. Great article. I hope to read more from you. Thank you for sharing. I am considering buying an electric car as well so it’s nice to read about your experiences. Thanks so much. Stay tuned. I am hoping my stories and practical advice will help you make your decision. In 2006 we bought my wife a Prius for many reasons — HOV lane access (since revoked), financial incentive from her employer (Google), tax incentive from government ($3500 tax credit). The latter made me smile and smile…until I actually did our taxes the following April. We got hit by AMT, and under AMT all of the $3500 tax credit was disallowed, and we got a tax credit of $0. I hope you do not run into something similar. Argh. That sounds really frustrating. So much for being rewarded by the government for being a responsible citizen. I plan to blog soon about the financial incentives my husband was promised. We will see if they all come to fruition. I hope you keep reading. Thanks for sharing. Excellent piece. I am a fervent student of history for in history is quite often the answer to our problems or issues. In the past we adjusted to what the technology delivered. Animal power or mechanical, it did not matter. But the gasoline or diesel powered vehicle changed that. Advertising changed more and financial considerations even more. Electric cars right now as like the telephone was early on. But great strides are being made. If in you case the answer is to ask for more charging stations, then, do just that. If the answer is to adjust you life style to the limits of the car, then, do just that. I have a 2008 Mercury Mariner hybrid. I absolutely love running it on electricty. Very limited but it works fine. Last week I was able to ge 47.8 MPG on a 12 mile run. The posted MPG performanc is 31 MPG or so. Right now I just installed solar panels on the house last December and now I wish for a plug in electric hybrid. I hope to buy one in 24 months or less. For most of my daily needs I can run the vehicle on electrical power. Many thanks for your posting. Good luck. Thanks so much for your comment Ramon. I like your historical perspective here. I do think that in the long run, electric cars will indeed be the way to go. I am a strong believer in innovative spirit and think that batteries in these vehicles will just get better and better. But for now, you are right, we need to demand more charging stations, and perhaps alter our lifestyle a bit. I hope you keep reading as our adventure continues. I recently did some work for a small electric contractor (im a contractor myself). And for 2 months. All i did was ecotalitys “blink” charging stations. Customers who owned a leaf car, had an option of buying these 240V charging stations for their home use. This is really helpful. We are moving toward installing a charging station, and will look into this. limitless amount of low cost electrical energy. number of parts that you can purchase at a local hardware store. Tesla, but it certainly gained a lot of ground with his research. If you want to put together your own version of one of these devices, keep reading. er, no, it can’t. If you think it can, tell us where we can see yours running. I have thought about purchasing a Chevy Volt but I was really hoping Nissan would design a Nissan Xterra electric car that would have solar panels so it can get a continuous charge as your driving and still be able to get anywhere you want to go, since I’m a photographer I been all over some crazy back roads all over the US! I seriously doubt the Chevy Volt could go 4 wheeling without messing something up on the vehicle! I think Solar Panels is the answer to all electric/hybrid car issues when it comes to finding a real solution for green vehicles! I love your story pretty interesting and funny! California needs more chargers available for everyone to have access to this technology! Thank you for the article. I am a new Leaf owner now as of Dec. 27th. Although I do have some range anxiety, I think that the car suits our needs greatly. I drive it about 50 miles a day, typically with the heater blasting cutting down our average mileage by 10+ miles depending. I haven’t put myself in a situation yet that would make owning my Leaf a problem. We have another car that will be our “long trip” family car when it is needed. I have to say that most of the apps for our smart phones or computers are horrible at actually tracking all the charging stations in the area. I think if one company really narrowed this down and was accurate, it would really make a difference on how many people look at the electric car route. We received a list of webisites and rebates as well as charging station information when we purchased the car at Sunnyvale Nissan. Our charging station will be installed for almost nothing in a couple weeks do to a Federal Gov. Grant. Did you receive this as well? I would be more than happy to get you a copy so you can take full advantage of having the station at home without the need for the 13+ hr. trickle charge at 110V every evening. Congratulations on your Leaf. Thanks for your comment. We did receive the information, and I posted a separate post detailing some of the information contained in the material. It is the “Financial Incentives” post. I hope you keep reading and sharing your stories. I’m leasing a 2012 leaf here in NY near the tristate area, I find the leaf’s range adequate. My commute is 26 miles round trip. On an average day I might drive 40-50 miles. I’ve driven it as far as 76 miles on a full charge with very careful driving. The car is very fun to drive, I had a 2005 mini cooper S previously, the nissan leaf has sooo much more instant torque off the line is amazing. I was thinking about getting a prius but when I test drove the Leaf I fell in love with the instant torque it has, the prius on the other hand, although it has all the range, cannot put a smile on my face like the leaf does. BTW i’m not an environmentalist, I don’t believe in man made global warming, I really more than anything choose the leaf because it is a real new car, combustion engines have already been put into cars in every possible configuration and way. I find the combustion engine technology dated, overly complicated, extremely fragile, high maintenance and worst of all.. boring. Thanks for writing. One thing I am really wondering about is how the cold weather impacts your range. I used to live in Connecticut so I know how cold it can get in the Northeast. Here in California, it gets cold, but we do not know real cold. Please share ypur observations.Does anyone else have experience with consistent cold weather and its affect on battery charge? I started the lease in summer time here in NY, now in winter I would say about a 10 – 15 mile range loss when temperature is in the low 30’s, even more if I where to use the car’s heater. The heater in this car is really a range killer specially if you use D instead of eco when driving, I once left the car’s heater with my wife and baby, temperature set to 70 degrees while I went grocery shopping on a cold day, came back half hour later and 1\4 of the battery was gone. On the other hand, while driving the eco drive mode limits how much the heater can draw saving some battery and in turn it takes a bit longer to warm up the cabin. I normally let the car warm up in the morning before I head out to work using electricity while plugged in, I then drive with the heater off. On the plus side the heated seats and heated steering wheel do not make a noticeable impact on range and help a whole lot in keeping my hands and buns toasty. Definetly use the Climate Control timer to preheat or pre-cool the car before you go. Use the Nissan mobile app or website to turn on climate control just before you leave whenever you’re plugged in. I’ve found it’s great since it usually manages to defrost the windshield for me, saving the time and hassle of that also. The 2012 Leaf gains a standard battery heater, a heated steering wheel, heated front and rear seats, The 2013 also has the heated seats, etc. The seat heaters help keep you warmer for a lot less energy than the cabin heater. Do you have any estimates on the effect of slush and snow on the road? Most times the roads would be relatively clear of snow and slush, but if your driving while it’s snowing, it’d be nice to know how much to allow for that. Maybe stating it in terms of depth on the road surface, snow description (powder, slush, icy..), vehicle speed and outside temperature is a semi-scientific way to quantify the effect. And thanks for the reports from NY. I spent 5 snowy winters in Ithaca. We swap experiences and tips in driving the LEAF, some projects to add accessories, etc. to the LEAF, guest speakers etc. It’s a way to get plugged in to your LEAF. For charging directories, I use:http://www.plugshare.com/ and http://www.chargepoint.com/ . I find them to be the most accurate and up to date with real time charger status. I’ve been driving EVs for 10 years / 102,000 miles so far. The 1999 GM EV1, 2002 RAV4 EV, 2011 Nissan LEAF. Loving it. Our secondary car is the 2002 Toyota Prius we use for longer trips.It often sits unused for a month or more at a time, but it’s there when we need it. Fast chargers really help with range anxiety and making adding 10 or 20 more miles of range quickly really doable. When the fast chargers are working (that’s presently their one big downside – sometimes they’re just off-line and unusable – but hopefully this will quickly improve!) you can rapidly add some charge the way you might drive a few miles to get to a gas station and take a little time filling up, but without the gas fumes. They’ve made many of my trips between Berkeley and Palo Alto easier to make a sure fire round trip. While I can make the round trip on one charge if I’m very carefully driving, it’s great to be able to go fast when I need to make an appointment, then just top up some charge while getting a quick cup of coffee at the nearby Peets at the Hayward QC station, or the several QC’s along 101 between Redwood City and San Jose (without the nearby Peets). 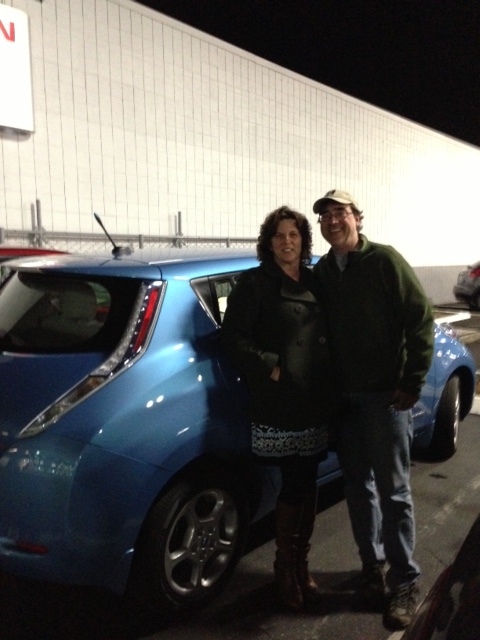 We leased the Leaf too on 12/27/2012 from Sunnyvale Nissan (Hi Laurie, we probably sat next to each other.) It was supposed to be my commuter car but I have yet brave enough to take it to work due to range anxiety. My husband gets to take it to work and he enjoys it and it’s still the only Leaf @ his work among 2k +/- employees. He got some of his coworkers interested in getting one too. We finally got the plates yesterday and will submit the HOV application today. The instruction is not very clear to us. (ie, we need to have possession of the registration card before we can apply?!) My commute is 62 miles partly on hilly 280. Too bad employees are Not permitted to charge at work, depsite I work for Department of Energy, which offers all those rebates. What a shame. They claim due to tigher budget, they don’t have fund to install the charging station for personal vehicle. And they need to persuade whoever the government funding is not for personal use. I think they should have a reverse thinking and promote from within. But my voice is too tiny and I am a rookie here. Chicken s—. 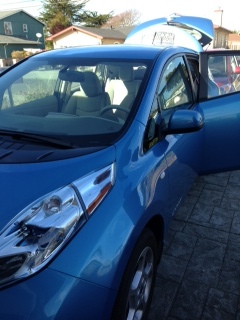 Our PGE bill jumped from $40 to $110, say about 18 days owning the leaf. (around 650 miles total charge.) Minus turning on heat, gas fireplace, it’s about $45 on the EV charge. (the rate jumped to 35 cents or so/kwh the last few days of billing cycle.) We did purchase and have received the “EVSE” from “Phil” and waiting for the adapter we purchased on eBay to be delivered. Also we’re waiting for PGE to assess and change our rate plan. Hope it’s the right move. Since we live in a townhouse community and heard the contractors asking crazy price (based on MNL), we do not consider Blink now. Wonder if we are still eligible to apply for it, say, 1 year later, if we move to a permenant single family home? We charged @ Mt View Civic Center a few times. Luckily we never run into situations it got fully occupied. And we still got excited talking to other EV owners if they’re around the charging station. We also charged at Santa Clara Water District and walked to Oakridge Mall, and Whole Foods for grocery shopping. The EV makes us walk a lot, which, is really not a bad thing. =) Hope to see more of your articles. Have fun with your EV! Thanks for reading! It sounds like you are enjoying your Leaf. You bring up lots of great points, and now, I am a little afraid to receive our first PG&E bill since leasing the Leaf. I will let you know if it brings similar bad news. My husband filled out the HOV sticker application last night. It is our understanding that you need to have the plates in hand before applying, which we now do. This will help me if I am ever brave enough to make the 40-mile, one-way trek to work in hopes that I will have time to take the car to the nearest charging station (about 1/2 mile from work), and then, walk the rest of the way to work. At least I will get my exercise in too. I have not broached the topic of having a charging station installed at my place of employment, but plan to do that, and will blog about it when I do. One reader of this blog wrote to say that he works at Intel, and there are 40 employees with green vehicles, yet there are only two charging stations. I am assuming that your commute is 62 miles round trip, and not one-way, right? I will do some research to see if you qualify after a year of ownership for the EV Project. My understanding is that there is a three-year commitment, so there is a chance that if you are already one year into your three-year lease when you apply, that you might not qualify. What do other readers know about this? Yaya – Hey that’s COOL! I initiated the upgrade of those chargers at the Santa Clara Water District from the obsolete Avcon standard to the J1772 standard that works with current EVs. I’m thrilled to see it used by other ev drivers!! I got the project started helped the SCVWD with the upgrade application and they embraced the project. A joy to work with them. The EV chargers are also under their Solar Electric (PV) carport. The three J1172 stations are a short, relatively pleasant 10 minute walk to loads of shopping, including Whole Foods, Peets, Chili’s, World Market, Toys R US. Across the street there’s Trader Joe’s, Sees, a pet store, Barnes and Noble, Red Lobster, Chevy’s. Oakridge mall is a bit longer walk. You can also take a nice walk around the pond there. It’s also here where SF BayLEAFer’s got a hands on (Rats, no test drives) of the 2013 Nissan LEAF with the 6.6kW charger, some other nice tweaks and a list price on the base model that brings it under $20k with Federal and CA incentives. I do get a little excited about these things! 🙂 May all your driving be ZERO! If you are getting absurd quotes to install an EVSE in your garage, instead ask for quotes to install a “dryer outlet” or “welder outlet” and don’t mention the electric car. Then purchase an EVSE with a plug on it, or just stick with the Upgraded Nissan EVSE. As for your commute, as you say, speed kills (range). My wife has a ~65 mile commute and tackles it fine with careful driving. We also now own the WattsLeft gauge which really helps you know how much energy is left and you can easily adjust your driving to match the true available range. I would love to know more about the WattsLeft gauge. Can you provide more details of what it is, and a link to more information? You can send a message to the creator, Jim (turbo3). Turbo3 who sells the meter is also a regular at BayLEAFs meetings.He sometimes has a few to sell and does excellent install and upgrade of the meter at no additioanl charge. Yaya – connect with me to see if we can come up with some ideas for an EV charger or two at the DOE. Seems it might be good for them to get more experience with these great vehicles they are helping us get that help to curb global warming emissions, health care costs from pollution, avoid gasoline and all that entails, etc. Greetings! I am on FB bay leaf. Was in that 2013 Leaf debut meet-up in the water company too! =] Was reading Deborah’s new article and then revisited the EV project by ECOtality. hmm, DOE gave out $230 million dollars grants for this project alone but can’t allocate some puny funding for its own employees? Hold on. I take it back. DOE (HQ?) does allow personal EV charging, at least according to this link: https://federalfleets.energy.gov/federal_requirements/guidance but our site PIC said NO (nicely.) 😦 Looking forward to connecting with you thru Bay Leaf and hearing your proposal. Thx! Thanks for writing! We definitely need to push beyond the “guessometer” so we won’t be too panicked when it gets really low again. We’ll let you know when we see the “turtle.” And, once I figure out how to persuade my employer to install a charging station, maybe I can persuade my husband to let me take the car, just as your wife did. Nicely done. Hi Deborah we’ve developed the following technique we call it “Surplus Squeezing”. Lol. Keep an eye on the distance left on the satnav during all longer journeys compare it to the guessometer amount. Subtract one from the other. Go easy on accelleration and speed early on in the trip, and on longer journeys use cruise control and speed limiting and Eco mode, and if the difference goes “less than you need”, then lower the cruise control speed by a few mph – even down to 30 or 40 mph until you build up a comfortable surplus again, then increase speed again when you have a comfortable margin of say 15 miles spare (if you aren’t sure where to find a charger in the area you are driving). Obviously you can go closer to the line if you’re travelling home. This method is easier on a dual carriageway, as you won’t have a load of cars up your backside getting annoyed. We’ve done this on A roads here in the UK in our Leaf, Slow down on dual carriageways if the speed limit is 50 we drop it to 47, or 27 if 30mph, this doesn’t annoy drivers behind too much then, and that 3 mph difference soon squeezes out some extra miles. Once when we got completely misled by the satnav about a charging station out in the middle of nowhere on country roads at night (with no other traffic). It led us to a field on the other side of the charging point, according to my partner’s phone’s satnav, we had to drive around the block to get back onto a motorway for a few minutes. This was worrying as we had 2 miles less than we needed. So for the 4 miles of the 6 mile journey we even dropped the speed right down under 10mph – this gave us enough (on the guessometer) to actually get there even doing 50mph on the motorway for a couple of hundred yards. Shame the Nissan SatNav let us down that time! In an electric car like the Leaf you just have to accept that you can’t drive it like a petrol car with your foot down hard all the time, (unless you’re doing short journeys) even driving at the standard speed limit at higher speeds uses a lot of power as the motor is pushing the car through increasingly tough amounts of “air”, so at slower speeds you get more distance. Yours is a really cool blog….I own a 2009 Kandi Coco LSV EV here in Rockford, IL…it is Chinese made, and is imported thru KandiUSA in California…we have owned it for a year and a half, and LOVE it. I am sold on Electric, will probably buy a Leaf or a Chevy Spark EV next year…. BTW we put 4200 miles on the Kandi EV in a year and a half…thats a lot of miles at 35 mph, lol. The range is 45 miles per charge at 50 degrees or warmer. At 32 degrees its only 21 miles…but so darn fun to drive…. Thanks! I have never heard of Kandi. I will be on the lookout for them in California. We received our utility bill today and thanks to the new discounted rate, our bill dropped to almost half. Woohoo! PG&E was nice enough to apply the new rate from Day 1 of billing cycle dispite our approval date was a week past this billing cycle. It really saved a lot on gas cuz I’ve been taking my car to work like 10 times. You got a chance to take your car to work yet? There’s actually a bit of planning to do with the new rate cuz during the peak (or after going over the baseline) we started paying much higher rate about 34 cents/Kwh & lowerst 16-17 cents, vs. the old 13 cents flat rate. Have you received your CA rebate and HOV sticker? Me: neither. Hey Deborah, Have you heard about the new Fiat 500e coming to California end of May/2013? According to Dan Neil of the WSJ, it gets 108/122 city/hwy e-mpg. Giving it some serious thought and your blog is at least dialing me into the other factors I’ll need to consider before diving in. Yes. I have read some about the Fiat. It sounds promising, although I would be skeptical about the MPG estimates. We have never reached the top end estimates in our Leaf. Let me know what you decide. Hi there. The San Bruno and Millbrae Bart stations do have a few 120v plugs. They are hidden but certain spaces in both garages have one near by. The San Bruno station has a few more installed. With your 120v plug you would get about 1 kw per hour. Plugshare should have details on the San Bruno station. I haven’t had time to post the Millbrae plug locations. The electric age is among us now. If it wasn’t for the oil companies we probably would have gone to all electric by now but its about money and the circulation of it. Yeah, its amazing what they can do with automobiles these days. Fantastic stories and plain great writing/story telling. As my wife and I sit here researching our next (electric) car your stories brought tears to our eyes. Thank you! Hello Bill Thanks so much for writing. I hope they were tears of joy! Please let me know which car you pick and what factors you considered. By the way I just bought a new Mitsubishi miev…. I am debating getting an electric car period for my commute into SF. I guess my main question is – do electric cars get to park for free in parking garages? I am trying to cut cost on monthly parking fees and gas. How long do you have to charge your car typically? Can I plug in at 8am leave the office at 5 and make in back to redwood city? Any advice is graciously welcomed! Thanks in advance! Oh and are there any sites I should looks into parking costs for elective cars? Hi Katherine You will still need to pay for parking with the exception of San Jose. If you bought your EV in San Jose or live in San Jose you can park your EV for free. A full charge for a Nissan Leaf takes about six hours with a regular charger. A less available super charger takes less than 30 minutes. A full charge will get you back to Redwood City. You will not save money on parking but you will save money on gas.Thanks for writing . Let me know what you decide and if you have more questions . You would only be able to park in San Jose for free if you bought the car in San Jose. It is part of the city’s green program. We think it is great you own an electric vehicle or are thinking of buying one. My name is Stephanie and I work at a market research company. We are currently running an electric car study in the San Francisco area where we are asking people for their feedback on electric vehicles and you even get to drive a few cars. You would be compensated for the five hours you spend with us. We are reaching out to everyone and anyone who has an electric vehicle older than 2009. We are based out of New York so our resources are limited and are reaching you to you. If you are interested PLEASE visit http://www.sismarketresearch.com/studies/san-francisco-car-study.php — we would REALLY appreciate it as we are looking for people to participate at the earliest! Petrol stations will eventually disappear, as electric vehicles will predominately be charge while the drive is busy elsewhere, shopping, hair salon etc. The interesting business model is to think how many business can profit from offering ev charging. http://Www.electriccar2buy.co.uk/ have a uk charge map, there is more charges than you think. Oddly, I cannot find your original comment. Do you know what section you commented on. I apologize if you are receiving many notifications, and would be happy to fix it. Do you still own a Nissan LEAF? I’m writing an online piece for the Guardian that chronicles a few LEAF owners’ experiences owning electric vehicles. Basically a “day in the life” sort of thing. I am looking for people to feature in this piece and came across your blog and am wondering if you are interested. If so, I can send you a few further questions via email or we can speak over the phone. Please let me know when have a chance. yes. I am happy to speak with you. Hello, we currently have a second residence in southern California and wish to leave an electric vehicle (like a leaf) at this residence for 6 months unattended. After reading the scary posts about the Tesla becoming a brick if the battery completely discharges, I am concerned about leaving any electric vehicle undriven. Are there any solutions to this situation such as a trickle charger on the battery…or? thanx all in advance and I thoroughly enjoyed reading all the posts. This is the real story I hope you write. I am thinking of a Leaf, but would like a mapping program that would route in the charging stations. Of course the only DC Fast chargers are at Nissan dealers in my area, and availability is a scary thing. Do I want to beg for a charge, can I get one at the location? I really wish QT and Racetrack would put in chargers at their gas stations, at least they have food and WiFi. I can put on ten pounds charging my car, giving less range. Just because a plug in EV is zero emissions – doesn’t mean that zero emissions were produced to make that car move. Although you’re not buying gas – you know you’re keeping coal fed power plants running. You’re just moving the pollution to other parts of the country. Although freedom from gas is great, you’re not free from pollution. That depends on how the electric is produced. Water, solar, wind, are clean. I am going to look into solar panels, many people are powering their electric car from solar panels, which makes the most sense for me. We need more clean electrical generation plants, not sure on nuclear as their is some risk involved. Electric could be totally clean, if we built clean plants, instead of coal fired plants. Even folks who live in the heart of coal country should be buying EVs because they’re the only type of car that will get CLEANER over time as the grid gets cleaner. Certainly for electric cars the future. But I still remain a lover of the old school, how can you not love this or this cars? Loving gas cars isn’t what this blog is about. This is an electric vehicle blog, right? Indeed, this is a blog about life with an Electric Vehicle, and I do find the relationship between EV drivers and ICE (gas) cars interesting. Sometimes, there’s an animosity which I am still trying to get a handle on to write about. I have a question! Nice blog btw. I just got a Leaf and I love it. But, if I have it charge all night and let’s say it has a full charge at 2:00 am and I leave work at 5:00 am. Does it keep charging and I have to pay for the 3 hours of electricity? I didn’t mean to make that sound like a math problem either! 🙂 Any additional tips you can give a newbie like myself is more than welcome! Congratulations Steve! Welcome to EV driving. If you are charging on a non-residential commercial charger, yes, you will have to pay the hourly fee for as long as your car is connected and even though it is fully charged. However, if you have a home charger, it shuts off as soon as it is fully charged. And also, you can set a timer so that it charges during non-peak electricity hours. What state do you live in? Hey Deb, I live in Chicago, Illinois. I’ve been looking at EV’s for a while and my wife drives a gas engine so I figure why not. Daily commuting 50 miles a day and have yet to run out of juice! (2015 Nissan Leaf Model S.) I rate the leaf as one of the ten top smartest decisions of my life. Mike You have an amazing family! That must be a new record: three EVs in one family. Now, you need a Tesla and you can shed the ICE vehicle in the garage. 🙂 Congratulations on being such an eco friendly family! Dont be nervous about unplugging another car, especially if the charger says the car is full. Also, Teslas never finish charging so they should understand that someone may have an emergency and need a few miles to get to their destination. We gotta help each other out. Just dont forget to plug them back in when you leave. Nice blog iestainback. It is nice to see that fast chargers are popping up in your area. I did 40 amp highly recommended. It changed my viewpoint on my electric now I have no anxiety about range because I always have a full charge! If you are doing it use 50 amp if you can. As cars get higher range I am guessing a little more amps will be a smarter choice. For some reason I think you need a fourth wire for ground. Check with an electrician as I am not an electrician, just a Leaf owner. If I was running new wire I would make sure I am doing it right.